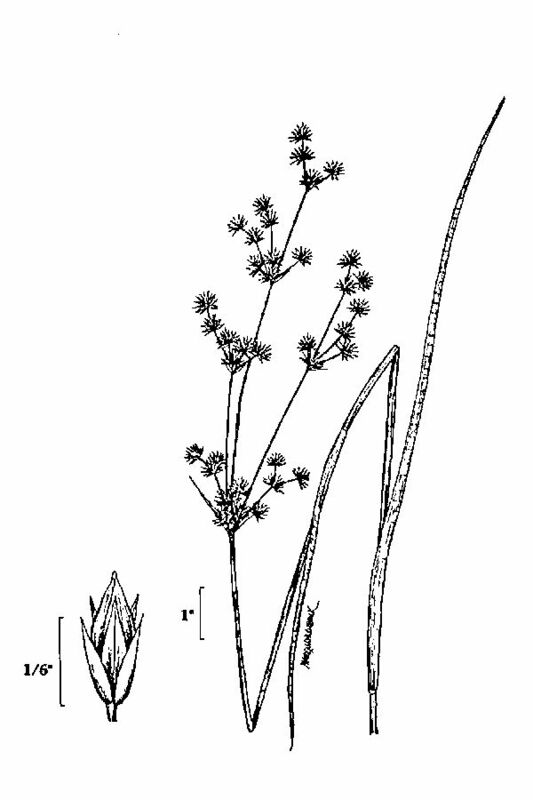 Juncus canadensis.USDA-NRCS PLANTS Database.USDA NRCS. Wetland flora.Field office illustrated guide to plant species. USDA Natural Resources Conservation Service (Accessed 5/2014). Juncus canadensis is a perennial rush, 20-80 cm tall, clumped, stems stiffly erect, smooth. Leaves round in cross section, with horizontal partitions (septate), slender, about 0.2 cm thick. Flower heads 2-20, rounded on top with flattened or conical base, petals to about 0.4 cm, sepals green, pointed, about equal to the capsule; inflorescence at top of stem, unevenly branched, taller than leaves or short, leaf-like inflorescence bract; blooms July-Aug.
Fruit capsule 3-sided, 0.3-0.45 cm, with short beak, internally 3-parted but partitions incomplete, seeds slender ca 0.1-0.2 cm, with slender, whitish appendages longer than body of seed; fruits July-Oct.
Habitat: Open marshes and wet edges. Usually in acid soil pH 4.5-5.9, tolerant of fire, moderately tolerant of salt and shade, intolerant of drought (USDA, NRCS 2010). Notes: Inflorescence possibly attacked by gall insect Livia maculipennis (Homoptera), which causes congestion of flower heads (Patch 1916, Brown 1979). Sometimes planted in wetland restorations.